One impact of climate change is an increase in tropical cyclone. 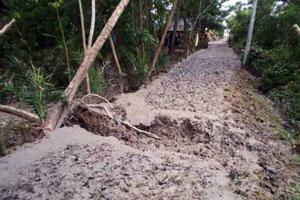 Photo shows the Cyclone Aila damage road in Kalapara, Bangladesh. Governments met June 1-12th in Bonn, Germany to discuss a negotiating text for a new deal on climate change. Caritas members from Europe, Asia, and Africa will be at the UNFCCC meeting to lobby negotiators for a text that reflects the needs of the poor. Bonn is a stepping stone to approving a post 2012 deal of climate change in Copenhagen in December. “People are already downplaying the idea of a comprehensive agreement being signed at Copenhagen and instead saying it will be a general framework with the details defined at a later stage. Science suggests we have to act now to avoid the most dangerous climate scenarios,” said Floriana Polito, the Caritas Internationalis Representative at the UNFCCC in Bonn. Caritas is calling for rich countries to met existing commitments on short-term funding for so developing countries can act now to adapt to severe weather and to state what funds will be available for long-term scaling up. The European Union must at least pledge €35 billion per year by 2020 to financing climate action in developing countries. The money must be in addition to existing aid pledges. Developed countries should agree to cutting greenhouse gasses emissions by more than 40 percent by 2020 and 95 percent by 2050 (based on 1990 levels). Above three quarters of the cuts must be domestic. Read the executive summary and the full report. “The report highlights the importance of adaptation technologies for both adaptation and poverty reduction, and the role that international cooperation can play in this process,” said Ms Polito. Caritas members taking part in a Climate adaptation meeting in Malawi call on negotiators in Bonn through a live video link-up, calling for socially-just post-2012 Kyoto deal. It took place on Tuesday,9 June from 18:00 – 20:00. Read Caritas blogs from Bonn and Malawi.